On an overcast Saturday morning, on our way back from a jog down a quiet winding road in a small town in Maine, my father and I passed Noboru standing next to his red truck in his driveway. He looked sturdy, a little heavier, a little balder than last year. My father and Noboru have known each other for a long time, but they never make appointments to see each other. It was only until recently that Noboru installed a phone in his one-room house that he built with his own hands. He spends most of time reading, or in his workshop next door. “Are you still living in New York?” Noboru asked me. I told him yes. “I’ll never go back there,” he said. Before Noboru lived alone in Maine, he was in New York. He worked as an architectural designer, subject to a fast-pace, stressful life. He developed cancer. Attributing the disease to his lifestyle, he moved to Maine, and recovered. Morning walks, a macrobiotic diet, and making birdhouses were part of that process. Noboru told my father and me he hadn’t been making birdhouses lately because not enough people were buying them. But he agreed to show them to us anyway. Gingerly he turned the door handle of the bright red shed, giving it a gentle push. The door made a high-pitched squeaking noise, as if caught by surprise. 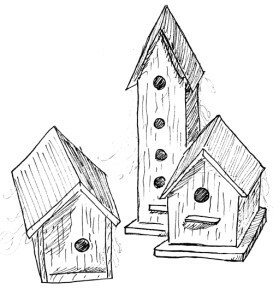 The birdhouses had a layer of dust over them, and cobwebs had begun to envelope them like fishnets. Noboru makes his birdhouses with all “found” materials— door hinges and tiny pieces of tin roofs and driftwood. Many of his birdhouses have branches extending from, or even enshrouding them like vines. One birdhouse is a triptych—a red house, a blue house and a white house, stacked one on top of the other, and secured by thin iron rods. Another is made from layers of birch bark. The word “peace” is inscribed on a number of the houses, written sideways in white paint, and engraved on a square of bronze hidden behind a tiny wooden door that opens like a mailbox. As we admired the birdhouses, a van pulled up into the driveway. No one ever comes to visit Noboru. 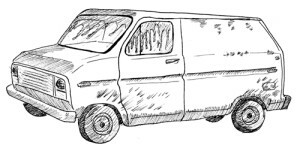 The van door slid open and a woman in her late fifties emerged. She wore glasses, a black shirt, and a long skirt with streaks of blue and pink across it. Her light brown hair moved buoyantly around her head. 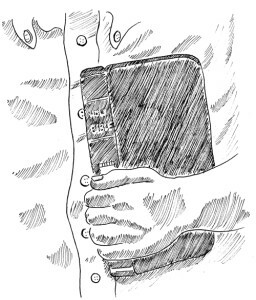 She walked towards the house, carrying a blue pocket-sized Bible and a folder that said “The Watchtower” on the front. “Good morning,” the woman said cheerfully, like a neighbor delivering banana bread. “Do you live here?” she asked Noboru. The woman smiled. Noboru’s face was motionless, as if he were wearing a Japanese mask. “Do you believe in God?” asked the woman. “I’d rather not talk about that.” Now, he looked a bit disturbed. “And how about you?” she turned to my father, whose forehead was covered in small beads of sweat from our earlier jog. “I am an atheist,” he said, with an audible leftover accent from his Southern upbringing. The woman nodded her head up and down, up and down, curls bouncing. The room breathed out a musty, damp wood smell. I studied the intricate patterns on the floorboards. Noboru looked out the screened window, towards the street. The woman looked at Noboru, and my father looked at the birdhouses, which suddenly felt like human presences that had been intruded upon. “I think that if God were to exist, he or she would live in these birdhouses,” said my father, gesturing in their direction. “Yes, I think God encourages everyone to find his or her own creativity.” The woman looked at Noboru. “He doesn’t want to talk about what he believes in, does he,” she said, with a smile that bordered on sadness. “Thank you,” she said, still smiling. “Enjoy the day.” She turned from her spot in the doorway and got back into her car, joining the group waiting for her. The door slid closed, clicking with a certain finality. Noboru absentmindedly ran his hand across the roof of a birdhouse. We all faced the birdhouses now, which stood silently like upright monks. 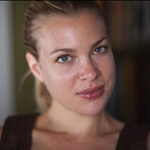 Elyse Lightman holds an MFA in Creative Nonfiction Writing from the School of the Arts at Columbia. When she is not writing about Maine she writes about Cambodia, which is where she helps run a non-profit to empower a new generation of women leaders. She lives in Brooklyn. This entry was posted on Monday, January 25th, 2010 at 8:05 pm	and is filed under Essays. You can follow any responses to this entry through the RSS 2.0 feed.